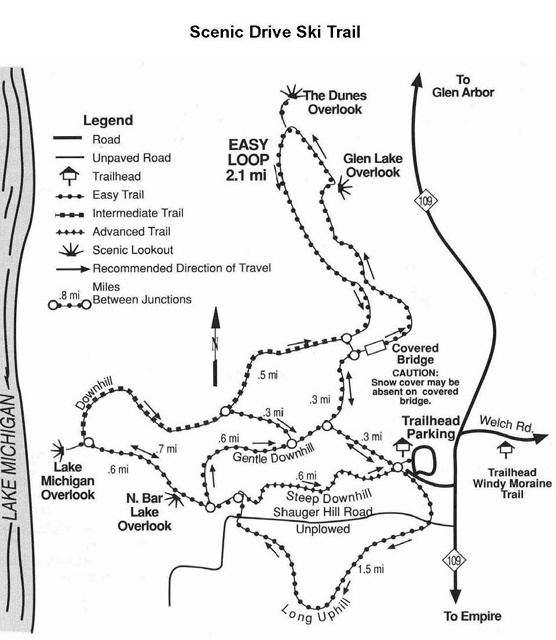 The Pierce Stocking Scenic Drive Ski Trail includes the Shauger Hill Hiking Trail and the unplowed Pierce Stocking Scenic Drive. It offers views of Lake Michigan and the dunes. For your safety, stay back from the edge of the steep bluff. Pets on a 6′ leash may be taken on the unplowed roadway section of the trail, but the Shauger Hill Trail section is a Designated X-Country Ski Trail and Pets are not allowed on this section of the trail between December 1 and March 31.